There are two types of algae; microscopic plankton algae (green water) and filamentous algae (string algae). Algae are single celled aquatic plants that need sunlight, food and carbon dioxide in order to thrive. All three elements are present in the average koi pond which provides the ideal environment for algal growth. Algae are one of the koi hobbyist’s major nuisances, but are also part of a healthy pond. Many times algae help to filter the pond as it consumes nitrates. In fact the filamentous type can even act as a "bio-filter” by providing additional surface for good bacteria to grow on. Although, algae in excess may clog filters and pumps as well as being unsightly. During the daylight hours algae will create oxygen, the process known as photosynthesis. Photosynthetic activity of algal blooms can make pond water become saturated with oxygen. This is certainly not a bad thing, but at night algae will consume lots of oxygen. In extreme cases of too much algae the dissolved oxygen level can dip so low over night that it could kill your fish. So if your pond has an algae bloom be sure it also has adequate aeration and especially throughout the nighttime hours. Round the clock aeration is highly recommended. What is green water in my koi pond? The presence of single cell microscopic floating algae or plankton is commonly called ‘green water’. Green water, which can sometimes have a brown tint, is caused by an abundance of sunlight coupled with a surplus of fish, that are probably being overfed, which generates a large amount of organic matter, that will lead to high nitrates; the perfect environment for an algae bloom. Many times this condition is common in new ponds or ponds with inadequate filtration. Filamentous algae is sometimes called hair-algae, pond moss or string algae. It begins growing up from the bottom of the pond early in the season and will also form on waterfalls and streams. As it grows higher the string algae breaks away and floats to the surface creating the dreaded ‘pond scum’. String algae thrive when filtration is undersized or the good bacteria are insufficient for the pond size. Making matters worse, the good bacteria are slow to colonize in the spring due to cool water temperatures so filamentous algae may flourish. How do I control green water and string algae in my koi pond? 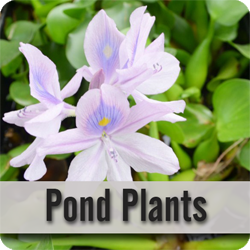 As your pond ages and more bacteria and / or aquatic plants are introduced, or will have had time to develop, they will eventually compete with the green water for nutrients giving way to clear water. Green water and string algae can be discouraged by taking the following steps. Reduce feedings to a minimum. Introduction of lots of floater plants like water hyacinths. Implementation of a bog, or circulating pond water through tubs of plants continuously. The plants will use the nitrates and compete with the algae. Provide some shade. You can use sheets of Styrofoam to float on the pond surface and cut-down on sunlight. (They may not be pretty, but serve the purpose.) Blue dyes are sold for the same purpose. But if you are having a hard time seeing your fish in green water it only makes sense that a blue color would hinder the observation of your koi just as much. Purchase and install an ultraviolet clarifier as part of your filtration system. The use of flocculants will bind the microscopic algae producing particles that a mechanical filter is able to successfully remove. Flocculants are plant friendly. Green Water and filamentous algae can also be controlled with certain chemicals. All chemicals must be used with great caution. You must know the precise water volume of your pond in order to accurately treat it chemically. Be aware that dangerously low oxygen levels are a side effect of chemical treatments; as the algae die and decompose oxygen will be drastically reduced. How do I achieve a balanced koi pond? Often a combination of chemical and natural methods is used to control algae; your ultimate goal should be natural balanced pond. To control algae naturally we must limit sunlight and nutrients. Sheltering your pond from sunlight will make algae growth much easier to control. Nutrients in the pond environment are fish waste, ammonia, fish food, decaying algae, and even phosphates or nitrates in tap water. The sources of nutrients need to be removed from the pond. The pond should have good circulation and aeration. Remove excess debris on the pond bottom as it will encourage string algae growth. The dissolved nutrients such as ammonia, nitrate, and phosphate need to be removed biologically. This is accomplished with bio-filtration in a mechanical filter. Use aquatic plants to compete for nutrients that algae need. Recognize the short smooth growth of algae on the walls of the pond. It is essential to establish a nice balance and helps to keep the water clear. This algae and bacteria on the walls of the pond also act as a bio-filter. Do not scrape the walls of your pond as you will be removing much needed good bacteria. If you choose to chemically treat your pond to control algae you should do so with great caution. Algaecides will be harmful to all aquatic plants not just algae and should be used preventatively before your water is pea soup green. Be conscience of oxygen levels because low levels are a regular occurrence with aquatic plant life die off.